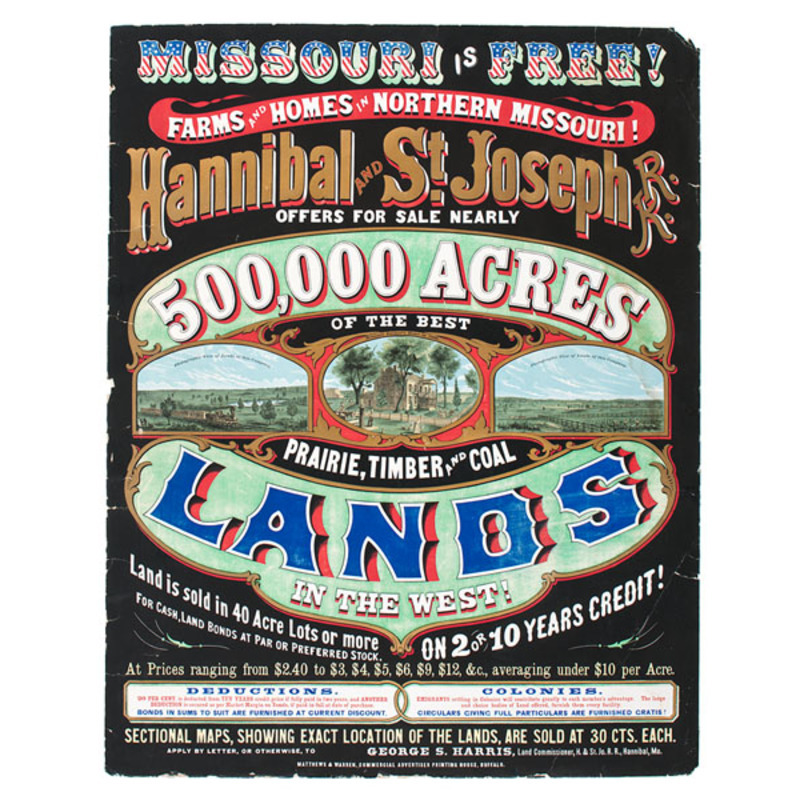 Spectacular six-color broadside for the sale of Missouri lands by the Hannibal & St. Joseph's Railroad; 22 x 27.75 in. ; Matthews & Warren, Buffalo, NY, printers.Â Post-Civil War, ca 1866-1868, with Missouri Is Free! in patriotic lettering at top, offering 500,000 Acres of the Best Prairie, Timber, and Coal Lands in the West!, situated in northern Missouri.Â Features two images of the green lands and blue skies, labeled Photographic Views of Lands of the Company, on either side of a Missouri Farmer's Home in 1866.Â Land is offered in lots of 40 acres or more, for cash, land bonds, or preferred stock, on two or ten years credit, at an average cost of under $10 per acre.Â Includes an appeal that Emigrants settling in Colonies will contribute greatly to each member's advantage, and that circulars describing the particulars of such an arrangement are available.Â We could find no other example of this broadside, but a smaller advertising card with identical text and colors exists in the collection of the Missouri History Museum. An exceptionally rare railroad broadside that still retains much of its vibrant color. Wear and minor chipping along all edges, and missing the upper right corner.Â Several 0.5 in. to 2 in. creases and light tears radiating from all edges.Â Large crease at lower right corner.